In Recordar--Latin American Songs of Love and Protest, Ani Cordero has created an album that reinterprets classic Latin American songs from the 1930s-1970s, with the goal of introducing this influential music and its writers to new audiences. Her album features songs by musical folk heroes who used music as a way of inspiring social change, including Victor Jara, Ali Primera, Atahualpa Yupanqui, Chavela Vargas, and Os Mutantes. National Public Radio has applauded Recordar, and her reimagining of these important songs. Ani is also an accomplished solo indie rock artist, combining Latin rhythms, folk and even a punk rock ethos on her two critically acclaimed Bloodshot recordings, Cordero and En Este Momento. 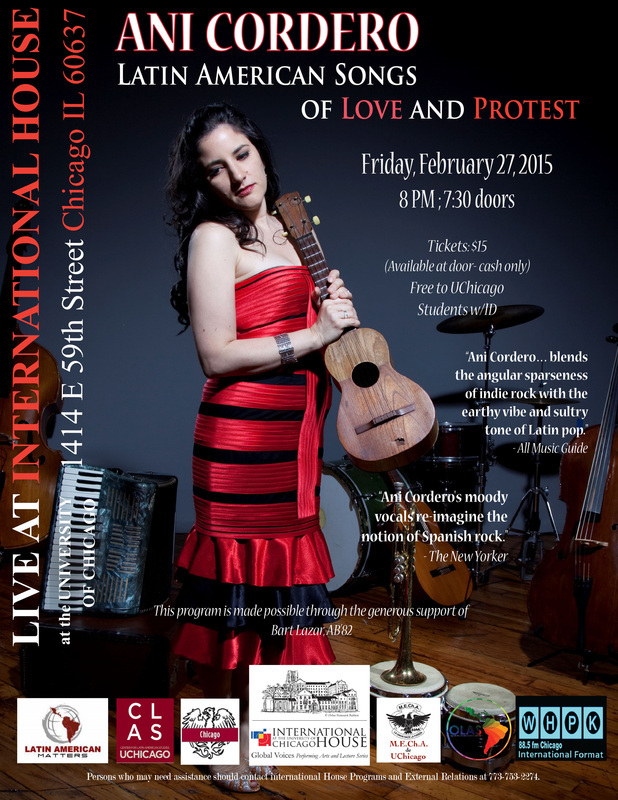 Please come and be inspired as the Global Voices Performing Arts Series proudly presents Ani Cordero and her band in an intimate performance at International House, where her updated versions of classic folk ballads, protest anthems and love songs will resonate for today’s audience. Doors open at 7:30pm. Free to University of Chicago students! Tickets are $15 (cash only at the door) for the general public. Group discounts for 10 or more available--please call the International House of Programs and External Relations at 773-753-2274. This event is sponsored by the International House Global Voices Performing Arts Series, the Center for Latin American Studies, M.E.Ch.A. de UChicago, Latin American Matters, the Organization of Latin American Students, WHPK International Format, the Alumni Club of Chicago, and a generous gift from Bart Lazar, AB'82.